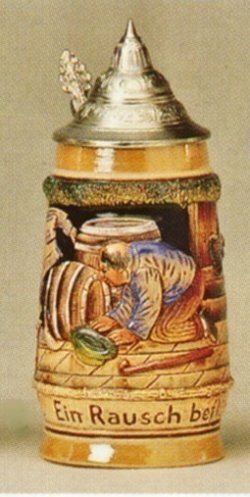 •This beautiful stoneware beer stein was handcrafted in Germany by King. •This new stein has a pewter lid. •The handpainted relief shows a humorous side for those that enjoy beer. •It pictures a man who has had too much to drink. The stein reads in German: "Ein rausch befluegelt. Erst nahm er all mein geld der schuft, dann setzte er mich an die luft". •This translates to : "Being drunk lets you fly. First, the crook took all of my cash, then he threw me out of his barn into the fresh air." •The humorous summary of this stein: Drink lots of beer and learn to fly •This large 1/2 liter stein is about 8.75 inches tall. •King-Werks, also known as Wuerfel & Mueller, is one of only a few remaining German stein companies that still produce 100% of their steins in Germany with 100% German materials and labor.